Can I start by telling you that our refrigerator is in our little living room? Our microwave is in the master half-bath, and the coffee maker is in our main bathroom. We have food in the cooler, stuff everywhere, and a floor half-finished in the kitchen. We've been working with a halfway (or not even) usable kitchen for about 7 weeks, and it is definitely getting old. That said, we are pushing through this week (and probably the next) to get the floor done as well as things a little more put together. 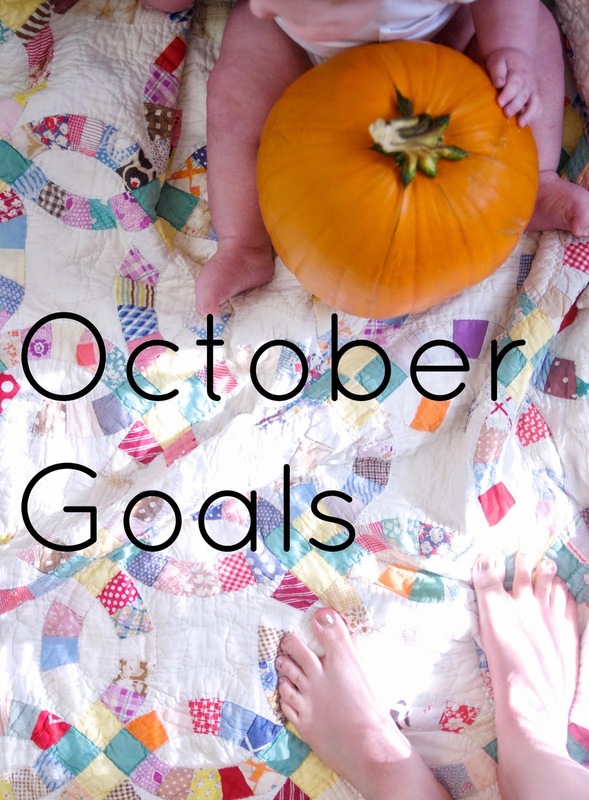 So, I'm keeping this month's goals small because I know a lot of my time will be invested in finishing up the kitchen project. First, how was September? Let's take a look. No fast food. We hit 98% with this goal. I ate at McDonalds once because we were stranded in Walmart until our car battery got replaced, but otherwise, that's it! Get started on my capsule wardrobe project. Not at all. Oh well. With all this kitchen stuff going on, we don't have the extra money for me to go dancing through the mall and spending big chunks of money on clothing. So, maybe in a few months I'll revisit this. Create daily goals list. I didn't do this, really. I pretty much forgot about this. Haha! Hope you get your flooring finished up soon! That would be so hard to deal with- especially with a mobile babe. Looking forward to the series!